Now I’m not a planetary astronomer, but like you, I’m excited by any kind of space exploration, and this year the NASA missions, Dawn and New Horizons, will give us the closest and most detailed views of dwarf planets yet. What is a “dwarf planet,” you ask? Excellent question. 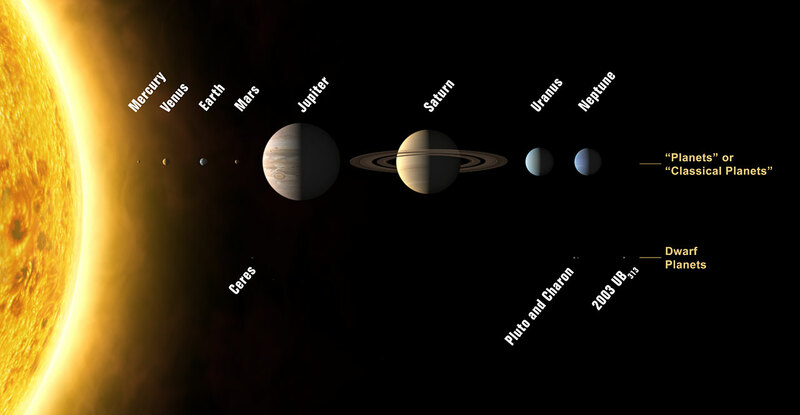 Until about ten years ago, astronomers usually referred to small planet-like objects that were not satellites (moons) as “planetoids.” In some ways, they resembled the eight more massive planets in our solar system as well as Pluto, which had a borderline status. Astronomers discovered Charon, Eris (previously called 2003 UB313), and Ceres, and they expected to discover many more, likely rapidly expanding the ranks of our esteemed class of planets. Either they all had to be included, or a clear classification system would have to be determined and Pluto would be reclassified. At the International Astronomical Union (IAU) meeting in Prague in 2006, astronomers opted for the latter in Resolution 5. They demoted poor Pluto, but I think they did the right thing. (I was working in Heidelberg, Germany at the time, and if I’d known how historic this IAU meeting would be, maybe I would’ve tried to attend!) The IAU’s defines a dwarf planet as “a celestial body that (a) is in orbit around the Sun, (b) has sufficient mass for its self-gravity to overcome rigid body forces so that it assumes a hydrostatic equilibrium (nearly round) shape (c) has not cleared the neighbourhood around its orbit, and (d) is not a satellite.” The criterion (c) is the important one here, because it means that the object has not become gravitationally dominant in its orbital zone, which is the case for Pluto and the other planetoids beyond Neptune and for Ceres, the only dwarf planet in the asteroid belt between Mars and Jupiter. These are contentious issues, and the debate even made it into the New Yorker. But let’s be clear: these things are small, and they’re all less massive than Earth’s moon. We don’t know as much about dwarf planets as we do about the planets in our system, so let’s go exploring! What do these new space missions have in store for us? Dawn has obtained excellent detailed images already, as you can see in the (sped up) animation below. The pair of bright spots in a crater stand out, and astronomers are trying to figure out what they are. They might be an indication of geological activity on it’s changing surface. Ceres has a rocky core and an ice layer, and it’s also possible that these are reflective patches of ice that have been exposed by space rocks falling in and striking the surface. For more information, check out this blog post by Emily Lakdawalla and these articles in the LA Times and Wired. As Dawn uses its propulsion systems to reshape its orbit and get closer views, astronomers expect to learn more about those spots, look for plumes, and examine the surface for strange craters or other distinguishing features. The spacecraft will later turn on its spectrometers and determine which minerals are present and how abundant they are. NASA launched New Horizons in 2006, and it had much farther to travel to reach Pluto. In January, NASA announced that New Horizons is making its approach to the erstwhile planet, though it’s still about 200 million kilometers away. Mark your calendars: it will fly by Pluto (as it will be traveling too fast to orbit) on 14th July, and at a distance of only 13,000 km, New Horizons’ instruments will obtain the best images yet of it. For more information, check out this article by Jason Major in Universe Today and Phil Plait in Slate. Distant image of Pluto by New Horizons. Credit: NASA/Johns Hopkins APL/Southwest Research Institute. A couple ago, leaders in planetary astronomy highlighted the importance of Dawn and New Horizons in their Decadal Survey. I think both space missions will turn out to be worthwhile, and let’s stay tuned to see what they discover over the next few months. ← Geoengineering and Climate Interventions: Too Risky or Needs More Research?